With the Wired Business Conference in our rear view mirror, I believe that it is time to delve into the events of that day, the interviews, and the speakers and presenters a bit more. For all women in business and women in tech, this conference was THE EVENT of the year. We, at The Business Magazine for Women, felt privileged to have had the honor of participating and meeting all these amazing people. I arrived at the new WIRED Magazine location on Varrick Street, NY in my Uber, with a Starbucks in one hand and my purse and notebook in the other. 8 AM, a bit early for me, but not for the rest of the business world. As I walked in, I was greeted by the WIRED staff, picked up my credentials, and made my way upstairs to the main event. To be honest, it was a bit intimidating. 400 guests, plus at least another 100+ people in vendors, waiters/servers and WIRED staff. A lot of people, all at once. And I wanted to speak to all of them, to find out about who they were, and to tell them about our magazine. Alas, between trying to set up interviews with the keynote speakers, prepping to record and take photos of the events, I had little to no time to socialize, that is, till later in the day. When it comes to how to do it right, WIRED nailed it. From a guest point of view, all needs were taken care of! There was breakfast provided, a very generous one, with everything from coffee to lox (smoked salmon for the non-initiated), with fresh fruit and veggie smoothies provided by appboy, one of the vendors that has nothing to do with smoothies but is instead a CRM for mobile marketing. Check them out, they’re awesome! I had no time for breakfast, or lines, or coffee. I was really busy, the entire time. With every break from the conference, the snack bar was fully stocked with something new, even more inviting. For lunch, we were invited upstairs to their larger studio space where tables were set up and a beautiful lunch was provided. This is where I was lucky enough to meet and talk with some of the most awesome people I ever met, among them the WIRED directors, vendors and one of the keynote speakers. I’m telling you, my table rocked! I will end this talk of food with the mention of the after event cocktail party on their awesome 360 roof. Drinks provided by Gentleman Jack and again this array of deliciousness of finger foods. As a guest, you were totally cared for, the entire day. 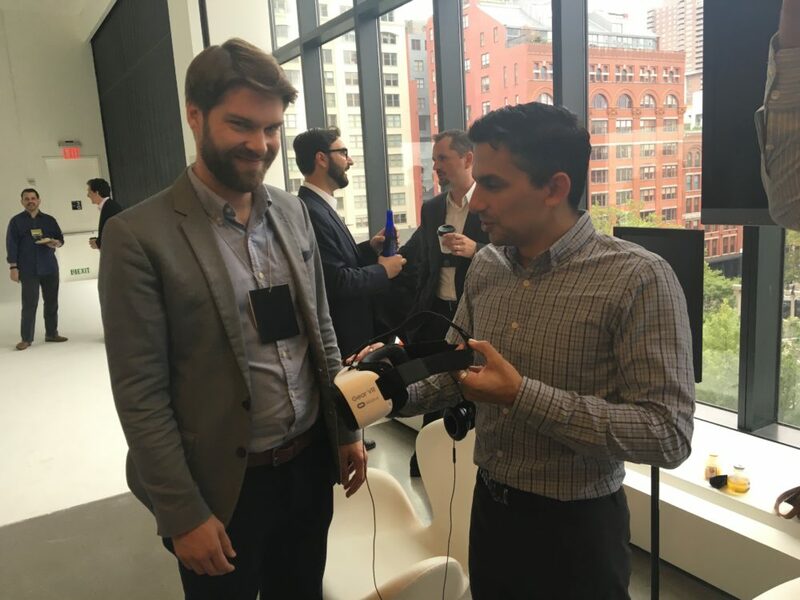 Of notable interest for me was Qualcomm’s Invisible Museum, and VRSE (now rebranded as Within) which was one of the presenters. Qualcomm bought their Invisible Museum and set up just for the event, a museum that showed some of the currently available options for their technology, and some of the stuff that they have in the works. Stunning and educational. Showcasing some of their tech, Qualcomm used AR (augmented reality) and brought the 6 totally white displays to life. I pointed my AR ready Sony tablet at a white chess board with 3 pieces on it, and the display came to life! Total magic for the non-techie person and edge of science of us tech people. Augmented reality overlayed over real objects, enhanced and interactive. The chessboard came to life, and so did every displayed that I pointed the Sony tablet at, with layers upon layers of AR showing the invisible tech that Qualcomm is responsible for. Great presentation, and if you have the chance to go see that this year, do not miss it! 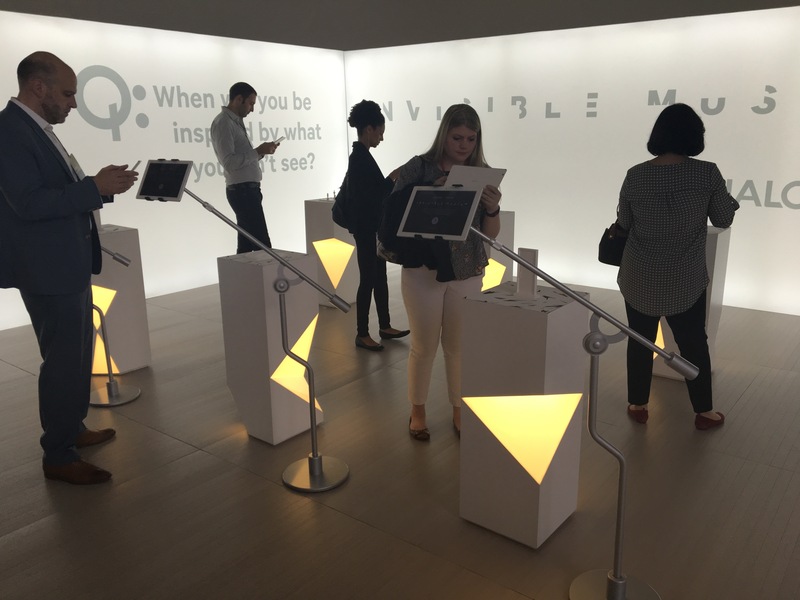 Qualcomm’s Invisible Museum is going on tour through the US. Now to VRSE / WITHIN, and how a train crashed into me, and I was lifted off the ground and into space. Yep. That actually happened. Well, it really felt like it was happening. With an OCULUS on and headphones securely set over my ears, I was transported to another universe. The guys at VRSE created such an amazing 360 environment, paired it with fully emotional music and high quality images that I did feel like I was about to get hit by a train, and when the camera lifts off the ground, the feeling of flight (you know, that pit in your stomach) came over me full force. So cool in fact that I wanted to do it again, and again, and then wanted to buy my own. VRSE has a few experiences in the OCULUS store. I highly recommend them! Now, the actual event, with the speakers and the editor and staff of WIRED, THAT was spectacular! If you haven’t read any of my previous articles or Facebook posts or twitter post, I have been a big fan of WIRED, from their early days. I like what they’re doing, I like how they present the relevant information of the day, I like their esthetic, I like the people who comprise WIRED, I am a WIRED fan through and through, and a lot of the inspiration for our magazine comes from WIRED, and a few others yes, but a lot of it is WIRED. The conference started with the Editor-in-Chief Scott Dadich giving us a proper welcome and an overview for the day. Clear, direct, and to the point, Scott delivers. I was kind of expecting keynote speeches. Hell, that’s what this section is called. But that’s not what we got. We got conversations, you know, the human kind! The format of the conference was more podcast than monologue. Out of the entirety of sessions that day, we had 1 speech/presentation/monologue, and it felt forced and staged. I think all monologue style presentations feel forced, because who would rather stand there alone, in front of 500 people and deliver for 10-20 minutes, instead of talking with somebody, sitting down and carrying on an actual conversation? With some people’s fear of public speaking, this is definitely the better option. Anyway, the actual conversations/interviews were educational, inspiring, and even heart breaking. Here’s some highlights, with more to follow in the following weeks. I just wasn’t ready for this session. I walked in after my first interview (with David Marcus, VP, Messaging Products, Facebook), and was ready to get back and listen to exciting new tech talk on mixed reality. I got that and a whole lot more! Rony Abovitz of Magic Leap, showing us real life photonics, kind of like seeing a hologram in front of you, without a device that translates that for you. It’s MR, mixed reality, not augmented reality, not virtual reality! It’s innovative! It’s a digital light field that interacts with your brain through your eyes. It’s the first time I heard about this! Imagine wanting to talk with somebody (like your sibling that lives across the country). You can bring them to (virtual) life in your living room, or wherever you are and have this mobile computing device, cloud accessing, powerful CPU GPU, real time sensing computer with you. Like the Matrix, but without being plugged in, and a Matrix that you control. I know it’s a bit of a hard concept to wrap your mind around, and I think that you’ll have to watch the conversation a few times to see what this does and can do. I was there, and I still feel like I could watch the presentation and listen to it a few more times. Bottom line, C3PO and R2-D2 show up in your mixed reality environment. And wait! Rob Bredow of Lucas Film and John Gaeta from ILMxLAB (Industrial Light and Magic) show up and you have to wonder if this is real anymore. What they’re talking about seems like a version of the future that I’d want to live in, not one that is (almost) available today. I cannot wait for the MagicLeap product to ship. It’s part fantasy, part cognitive psychology, part neuroscience, part computer science and part The Matrix. And it’s a bit tough to explain, but take a look and you’ll know what I mean. I can’t say enough about this tech, but this is the definitive tech of the year. What they’re talking about is its application to games and the real world and films. What I can see is it being applied to is communications, a real FaceTime, with the person sitting in front of you and talking instead of seeing them on your mobile device (imagine holograms), and in the creative process, allowing us to build things in this environment first, not too far conceptually from Iron Man’s lab. The title kind of gives it away. Kind of. What I wasn’t ready for is how cool the room got as Ms. Erica Baker, Sr. Engineer at Slack started speaking! Not temperature wise, but reaction wise, from the guests. The topic is simple, but extremely powerful. Even though the room was almost 50-50 women to men ratio, this topic was the most controversial! You can see how uncomfortable the room got. A must watch for all women (and men) in tech and business. I’m only a bit surprised! As a woman, I am only too familiar with inequality in the workplace. And since I’ve moved to the tech world, I have seen that the numbers in tech are worse than in business. The other side of the women in tech and women in business coin is the even lower numbers of black women actively engaged or hired by tech companies. Ms. Baker has been shinning a very bright light at this issue and she is offering solutions! Stay tuned for the interview with Ms. Baker in a later post, but here she is on the stage at WIRED talking about equality and diversity in the tech world. The more she spoke the harder it was for people in the room to stand still. Talking about uncomfortable issues like equality and diversity is tough! But I believe that Ms. Baker did an amazing job. It is about time that we have uncomfortable conversations. It shouldn’t feel comfortable if we’re trying to change the well established business status quo. It is an uncomfortable topic, that affects the lives of millions of women, white and black alike. It is a subject that needs to be talked about at every business and tech conference, at every board meeting, at every startup and well established business. Women have a hard time breaking into tech, and staying! Black women have an even harder time breaking into tech, and staying. Why? Find out why from Erica Baker in the video below. The entire conference felt relaxed, but still business. It left me inspired and lifted, and motivated to continue in putting together the most awesome business magazine for women that there is, and deliver quality and engaging content. The guys from HBO’s Silicon Valley showed up via video to talk to us about some new startups in Silicon Valley. Stay tuned for features and interviews with the keynote speakers and presenters in the weeks to come.